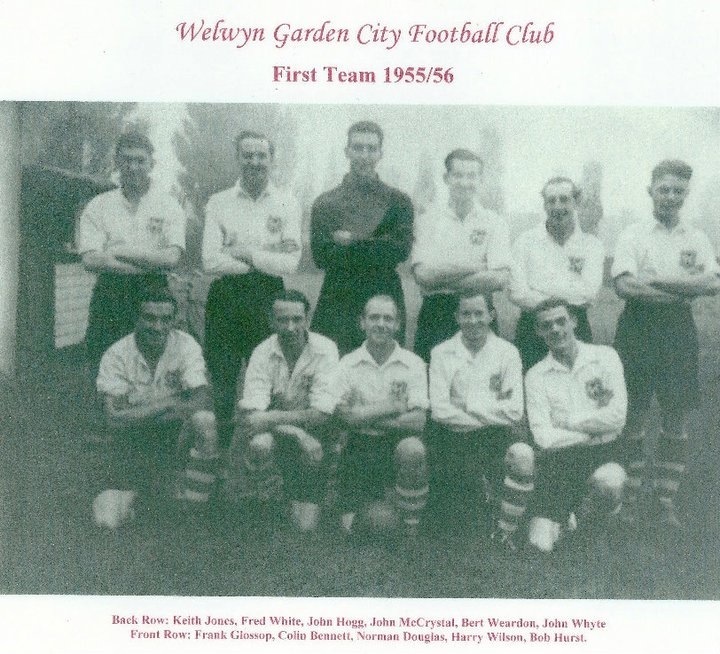 Founded in 1921, Welwyn Garden City FC started their days in the Metropolitan League. The Club then moved to the Spartan League, for the first of two spells, in 1927. During the 1927/28 season the Club gained its first honour, winning the Herts Charity Shield, beating Hoddesdon Town 5-2. In 1952 Welwyn Garden City joined the London League, later to become the Greater London League. At this time the Club were managed by Harry Hibbs, the one time England goalkeeper, Harry being one of two ex-internationals to be in charge of The Citizens, the other being Alex Massie who was capped North of the border. 1954 saw the Club return to the Spartan League and two years later they were elected Associate Members of the Football Association. The next stop was county football with a move to the Herts County League in 1959. The Club moved to its present home, Herns Lane, in 1968 and staged their first fixture at senior level, against Knebworth in the Aubrey Cup, on the 16th November that year. 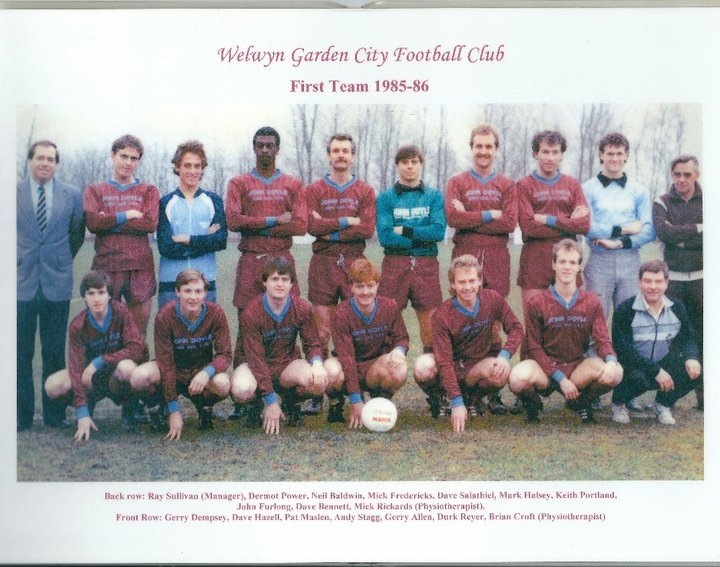 In 1973 Welwyn Garden City joined the South Midlands League and won the Premier Division championship at the first attempt. The following season they reached the final of the League Challenge Trophy, only to be beaten by Barton Rovers, 3-1 on aggregate. 1976/77 saw the Club lose their top-flight status, and there began a five-year battle to reclaim it. During these First Division years the Club were to finish no lower than 5th and in 1981/82, the championship winning year the Club scored over 100 league goals on route to the title. In the championship year the Club also reached the final of the League Challenge Trophy, but once again had to settle for runners-up, this time losing 3-0 on aggregate to Stotfold. 1984/85 brought about cup success at last, when under the management of John Sneddon they beat Pirton 2-0 to lift the first ever Herts Senior Centenary Trophy. At the end of the season John Sneddon decided to call it a day and he was replaced in the close season by ex-Sudbury Court boss, Ray Sullivan, and his first task was to rebuild the side. Twelve months later the Club finished runners-up, missing out on the title with some erratic form in the closing games. In 1986/87 and 1987/88 the Club lifted the Herts Charity Shield, making them only the sixth team to retain the Shield. The close of the 1986/87 season also saw floodlights installed at the Herns Lane ground. In 1988/89 the Club gained a top six league finish along with an appearance in two cup-finals, the League Challenge Trophy and the Herts Senior Centenary Trophy. However these were both lost in the space of five days. 1996/97 City looked to local man Malcolm Doctor, who the previous year had guided Citys archrivals Hatfield Town to second place in the South Midlands League. Everyone at the Club was optimistic about further glory days returning to Herns Lane. Two cup-finals were reached, the League Challenge Trophy and the Southern Combination Cup, but once again the Citizens missed out at the final stage. Upon the departure of Malcolm Doctor the Citizens forged a link with Conference neighbours, Stevenage Borough FC, and strengthened their squad with Boros EFCO youngsters along with the management pairing of Dave Bullock and Bill Bannister. However despite reaching the Third Qualifying Round of the FA Cup the season collapsed midway through and with the break up of the squad, a battle with relegation followed. 1999/2000 saw a rebuilding process with former Somersett Ambury V & E boss Dave Steadman being appointed and being given the task of leading the Citizens into the new millennium. However the clubs downward trend continued and in 2001-02 the club were relegated into the First Division thus ending one of the longest unbroken spells in the Premier Division. Guillermo Ganet was appointed with the task of restoring the glory days back to the club and following two seasons steered the club back to the Premier Division. The clubs first season back saw them finish in a very creditable third place however the end of the campaign saw the manager and most of the playing squad depart for Berkhamsted Town. Howard Cowley was given his chance in 2005-06; he brought about a wealth of experience from not only the South Midlands League but in all divisions of the Ryman league. During his tenure the club had an excellent 19 game unbeaten run in all competitions and also equalled their best ever FA Cup run when losing narrowly to the then Conference South leaders Histon. The club also exceeded its best ever run in the FA Vase by reaching the Fifth Round only for an administrative error to deny them the chance to go even further. Players Joe Devera, Nick Brindley and Harry Hunt were offered contracts with Barnet FC and the seasons top scorer, Bradley Woods-Garness went to Conference side Farnborough Town. 2006-07 saw the club achieve fourth spot in the league, becoming the only side to beat eventual League and Cup champions Edgware Town at their White Lion ground whilst doing the double over local rivals Hertford Town with two fine victories. Following the departure of Howard Cowley a succession of managers have tried to revive the fortunes of the club however this quick turnover of managers did nothing to ensure success in fact it had the opposite effect with relegation back to the First Division at the end of the 2009-10 campaign. 2010-11 saw the clubs poor form continue, this was not helped by having three managers in the season, Phil Read, Rob Pattwell and Simon Braine, the latter, with the help of assistant manager Adam Fisher, helped to steer the club away from the relegation drop zone. Adam Fisher has now moved on to Assistant Manager at Barton Rovers FC. 2012-13 saw Scott O’Donoghue working alongside Pablo Ardiles as the Assistant Manager for the first team and Mark Slater running the reserves. Scott left at the end of the season. This page was added on 19/08/2013. In response to Mark Dell’s recent posting. Mark you’re right about the incorrect reference to Welwyn Garden City In Bedfordshire & District League table for 1925/26. With regard to Welwyn FC in the 1926/27 season, on looking at the newspaper archives it seems clear Welwyn didn’t fold. There’s an article about a Mid Herts League, Division I game, a game in the Herts FA Junior Cup and reference to one of their players being suspended. In addition, the Non League Matters website shows a Herts Senior League table for that season with six participating teams, one of which is Welwyn (Welwyn Garden City were playing in the Spartan League at this time). Whether Welwyn played in both the MHL and the HSL that season I can’t say but as there were only 10 games in the HSL it’s possible. 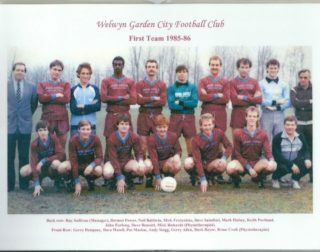 I’ve been working on the history of Welwyn Garden City FC but local historian Roy Williams is working on a much detailed history of football in the town (you may have read his book ‘Where Do You Think We Played’ published last year) and would be interested in swapping notes. He can be contacted via the Welwyn Garden City Heritage Trust. Further to Mick Barnett’s comments on 11/2/2017, I believe the team in the Beds & District League in 1925/26 was Welwyn FC, from the old town. They were due to compete in the same league again in 1926/27 along with Welwyn Garden City, but do not appear in the final table. Did they resign mid-season, or not compete at all? Does anyone know the answer to that one? The following season 1927/28 (Old) Welwyn were back in the Herts County League, but did compete in the re-named South Midlands League from 1933-35. Just a slight amendment to my previous timeline. They joined the Bedfordshire and District County League in 1926 and stayed there for only one season. 1935 Resigned from the league at the end of the season as they could not find a suitable pitch. At an AGM held 24th July 1935 it was agreed to wind up the club. Welwyn Garden City FC were founded in 1921, but did not start their days in the Metropolitan League as this league was not founded until 1949. Instead they played friendlies in 1921/22 before joining the Mid Herts League Division Two in 1922. They stayed in the Mid Herts for four seasons before moving up to Senior status in the Bedfordshire and District League for one season in 1926/27 before moving on to the Spartan League. WGC had a four season spell in the London League between 1951 and 1955 before rejoining the Spartan League. As a young man I was honoured to meet the great Harry Hibbs, who worked at Danish Bacon (DBC) as store manager. He was a gentleman. What a contrast with someone of his footballing ability today. Were it not a cliche the words ‘over-paid’ and ‘prima donna’ might cross my mind.